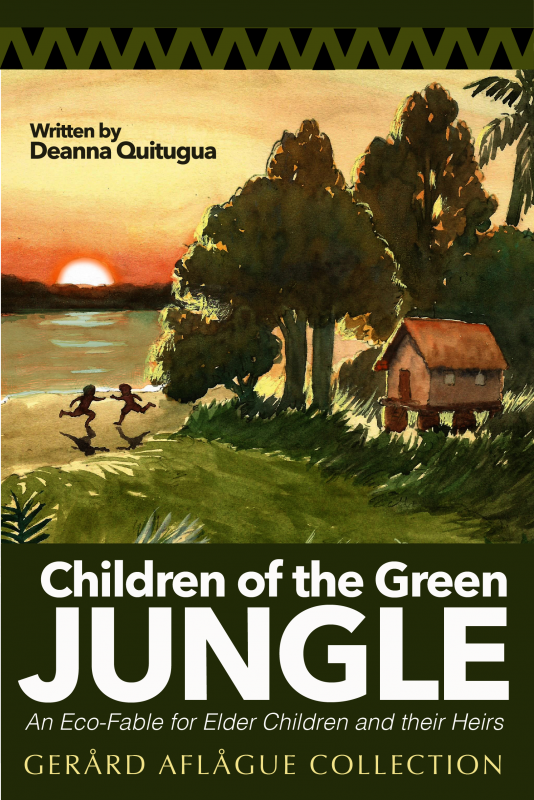 The Gerard Aflague Collection is proud to announce its latest book release, an eco-fable story entitled Children of the Green Jungle by Deanna Quitugua. This book is written for children and adults young-at-heart. Using allegory and colorful illustrations, this story is based on Chamorro history and provides a fresh view of the challenges and changes that indigenous ancestors have experienced under foreign rule for half-a-century by the Spanish, the Japanese, and the United States governments. Children of the Green Jungle illustrates the rapid evolution of simple island-life long ago to the complexity and diversity of today. The indigenous population, known as Chamorros, continue to struggle to retain their history, heritage, and culture. Although it is written for children, it retains deeper meaning for adults. The book alludes to the introduction of Catholicism after the arrival of Magellan as well as European diseases such as smallpox, which nearly decimated the native population. It moves on to the arrival of Japanese forces in World War ll and the often-cruel treatment upon the Chamorros. This is followed by the Liberation of Guam by US troops in 1944 which is widely celebrated with parades and parties. Today, many Chamorros still have a deep desire to hold on to their native culture and identity, while being denied self-rule for five-hundred years. The Children of the Green Jungle lends itself to consider other similar populations such as the Native Americans, Puerto Ricans, Filipinos, and others who strive to retain their native cultures in a complicated world. This title was written to offer an early introduction to Guam’s history for younger readers using colorful imagery and symbolism. It is also meant to encourage readers to assess the value and importance of their Pacific islander heritage. This book includes questions to prompt further discussion between children and adults. This 32-page soft-cover book is one of over a dozen titles published by the Gerard Aflague Collection. All titles are available for purchase on GerardAflagueCollection.com, Amazon.com, Ebay.com, and will be available in-store on Guam at Bestseller Books and Faith Bookstore very soon. Author Deanna Quitugua is a Guam resident, and former special education teacher. Born in Ohio, she was married to the late Joseph Quitugua who inspired her writing. Joseph, who was born in 1944 on Guam, was raised with family telling stories of the history of the Chamorro people. His family was incarcerated by the Japanese at the Maneggon Hills prison camp when he was 6 months old, prior to the liberation of Guam by American forces. He was self-reliant, well educated, served as a teacher and school principal, and a member of the Air Force. For more information, for purchases, or for interviews, please contact sales@gerardaflaguecollection.com. We'll email you our new designs! Type your email address below.